Veteran German thrash mongers Protector scorch a blazing trail of old-school death-thrash through Swedish woods, taking no prisoners. They channel all that is good from thrash metal into tunes like “Reanimated Homonculus” and “Antiman”, snapping necks furiously and without remorse. 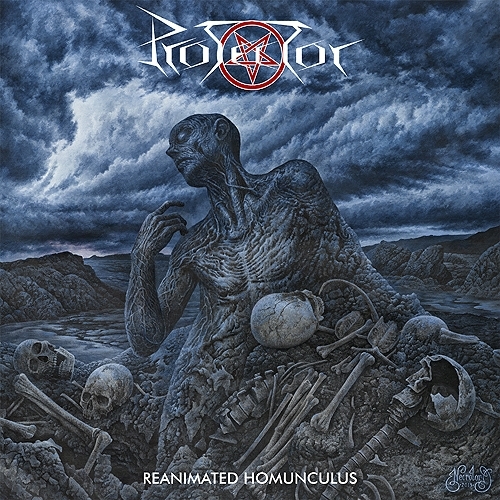 The competent, tight band delivers blood-curdling goods on this disc, Reanimated Homonculus. The recording has a ‘human’, warm tone, with an analog feel featuring abrasive, snarled vocals; live, acoustic drums; and choppy, overdriven guitars. Sporting a genuine, “underground” vibe, Protector will raise hackles and cause circle pits wherever found. The band proves they’re still a massive, bludgeoning force to master.